Organizing a corporate event is no small task. It requires foresight, attention to detail, and an innate ability to gather dozens of extremely busy business professionals in one room all at the same time. That’s why when it comes to the food options for your event, you need a trusted corporate catering partner. At Etai’s Catering, we specialize in serving up fresh, delicious, and healthy options for a wide range of corporate and business events — from early morning conferences to business lunches, meetings, and more. 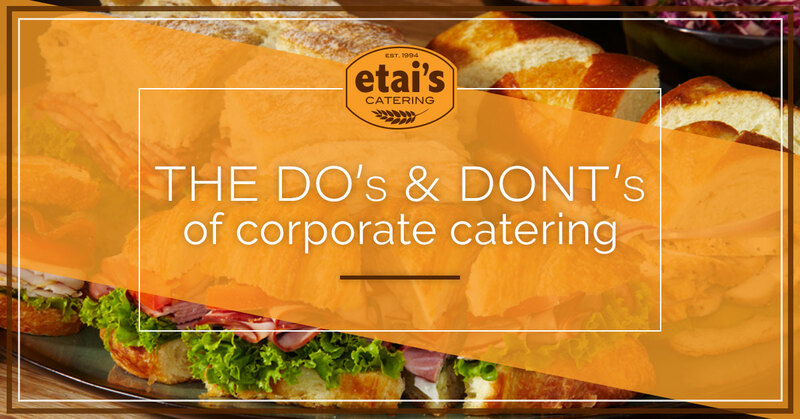 In this blog, we’ll provide a few tips on the “do’s” and “don’ts” of corporate catering in order to help you make the right decisions when it comes to serving the busy-bodies at your business event. 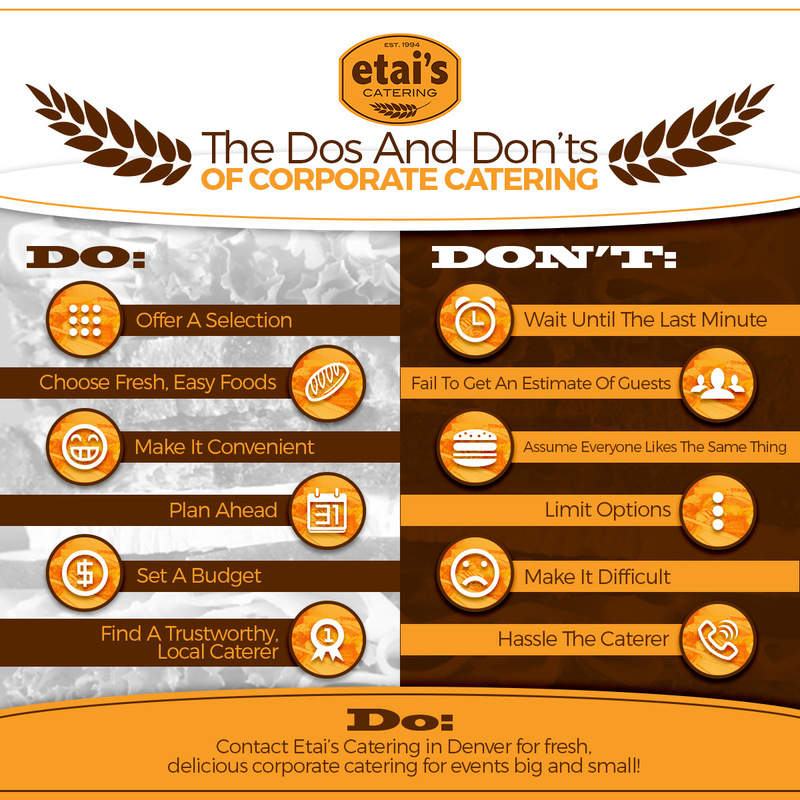 Keep reading to learn more and visit Etai’s for corporate catering in Denver today. Take a look at the calendar. You want to give yourself ample time to plan ahead for your event, and that means giving your local caterer enough time to have your preparations all taken care of. Ordering food for dozens of business professionals the same day as the event likely isn’t going to cut it with most caterers. At Etai’s, we can typically guarantee next day delivery for your corporate catering, so long as the order is placed by 4 p.m. the day before. So give us a call or order online — but just be sure you do so ahead of time! Everyone’s tastes and preferences are different, and while it’s impossible to plan for each and every individual, you owe it to your guests to at least have some sort of selection. Your local corporate caterer can help you choose from a wide assortment off the menu, from convenient boxed lunches to vegetarian salads and even gluten-free options for those with dietary restrictions. Having a good selection will help ensure guest satisfaction and cut down on waste. Another thing you want to avoid is putting your guests and the caterer in an uncomfortable position by not giving a proper estimate. The last thing you want to have is not enough food — but a close second to that is having too much food. Too little food will make people hungry and angry, while too much food will cause your budget to be out of proportion. Not to mention, your caterer needs to know exactly how many meals to prepare, and changing the amount the day or hour of the event is not going to turn out well for anyone involved. When you are catering toward a business crowd, it’s important that your food offerings reflect the professional, on-the-go vibe of your event. The last thing you want to do is have complicated foods that require a table, a ton of napkins, and a lot of work — largely because your guests won’t have any of that available. Instead, opt for something tasteful yet simple — such as our delicious box lunches. Etai’s specializes in catering corporate events in Denver, from small business gatherings to all-day conferences and more. Our team never sacrifices quality for convenience, and you can tell from just one bite that our foods are made by hand in our local Denver kitchens. With an attention to detail and commitment to quality and customer service, Etai’s Catering is bound and determined to help make your event a success. We make it easy to order online, and guarantee next day delivery for your corporate catering as long as the order is placed by 4 p.m. the day before. Call Etai’s Catering in Denver today or place an order online and see why we have been the local choice for fresh catering since 1994.